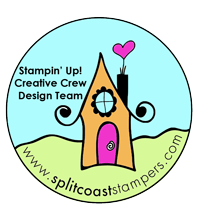 employee gift | Stampers With Altitude!!! With Valentine’s Day, right around the corner… Well, I thought I would bring back a great project! It’s not my original design so I don’t feel comfortable sharing the dimensions… however, I tried to find this box again and can’t find it anywhere. Just know, it’s not mine. Another demonstrator thought this baby up. I did something completely different with this box. I used the Window Box Thinlets to cut-out the shapes in each of the side panels and the Love Notes Thinlets to cut hearts out for the handle! Super cute!! Cut on the 4 score lines as shown. The run from the edge of the paper to the 1 1/2″ score line. You will notice that there are two cuts at the top of the paper and two cuts at the bottom of the paper. The other 4 score lines are not cut. They are only scored. Now, fold up the sides. The flaps should both fold into either side of the box. (where the cut lines are) I stapled the sides and the handle on at the same time. Using only 1 staple right in the middle to secure the box together. You will cover the staple with a scallop set (mine is the Kiss and the lips). What do you think? Pretty simple, right. Quick and easy! Makes a great gift for a co-worker, employee or anyone, really! If you have any questions, feel free to post them in the comment section! Scallop Circle Punch (Retired, I guess… woops) You could use Layering Circles Framelits, if you have a Big Shot. If I get 5 comments on this post, I will start a weekly Throwback Thursday project. What do you say? Can I get a whoop whoop?? Hehehe… Here’s a project that I created, so I don’t have a problem sharing the dimensions with you. You may have seen this project elsewhere but there is a difference. Mine is refillable. You can take the notepad out and put a new one in! Yay! Embellishments of your choice – I prefer to use only ribbon as the idea is for it to go into your purse. On your 8 1/2 x 11 card stock, put the 11″ side across the top of your favorite scoring tool. Score at 5 1/4, 5 1/2, 5 3/4. Turn your paper 90 degrees so that the 8 1/2″ side is across the top of your scoring tool. Score at 2 1/2 and 5 3/4. Fold on all the score lines. You will notice that one flap is bigger than the other. There is no real reason for this. However, I use it for the adhesive. I make sure the larger flap is on top. I put it on the under side of the larger flap so that the adhesive only sticks the two flaps together. That gives you a pocket to slide the notepad in. It’s an easy peasy project but it’s a great one. I brought it back for craft fair season and sold most of them. I am almost done with the challenges. Just one more to go! This challenge was all about gifts. It could be a tag, a box or anything “giftie.” I have an idea book that I keep all my projects in. So, I went to page one. There before me was not really a box. AND it fit the exact number of chocolates I had left…. 4 LOL!! yeah someone’s been in my stash. It could have been me, honestly but…. i don’t remember eating the whole bag! ANYWAY… Here’s my Dove or Bliss chocolate box/sleeve/not-sure-what-to-call-it-as-it-doesn’t-have-4-sides. You will also find a picture of what the inside looks like. I kept this simple so you can see some variations that you could do on your own (like adding or subtracting DSP, embellishments, etc). It’s a super cute and super easy project! It’s rare that we use bookmarks anymore with this age of technology. We read on our phones, tablets, laptops, etc. It’s sort of like a phone book. I can’t remember the last time I used one! BUT…. People do still read books, right? When I first saw these framelits, I thought of a bookmark, right away. The color scheme for the bookmark is Blushing Bride (the thick Baker’s Twine – I actually braided three strands), Very Vanilla and Sahara Sand. The So In Love DSP also has Soft Sky in it. For the tassel, I used the one out of the Cupcakes and Carousels Embellishment Kit since it was Very Vanilla. I think it turned out cute! For some reason, my phone is having a hard time picking up certain colors. I think it’s prettier in person! Hope your New Year is off to an amazing start! I know, I know. It’s not Valentine’s day, yet. As a matter of fact, I should be wishing you all a Happy New Year. Happy New Year!!!!! May 2017 be a fantastic year for you!! So, I got to playing with this Mini Egg Carton (New in the Occasion’s Catalog) and I couldn’t stop myself. The image doesn’t show the details but the thumbnails show more. The color scheme here is Soft Sky, Real Red and Whisper White. The egg carton was spritzed with Soft Sky Ink and some shimmer white paint (we used to sell it but don’t have anymore). You can’t tell how glittery it is but… oh baby! It’s gorgeous! Then, I went to town with the Layering Circles Framelits for the Big Shot. They are layered, from the bottom up, Real Red, Whisper White, Soft Sky, Whisper White. I used the Sending Love Suite. 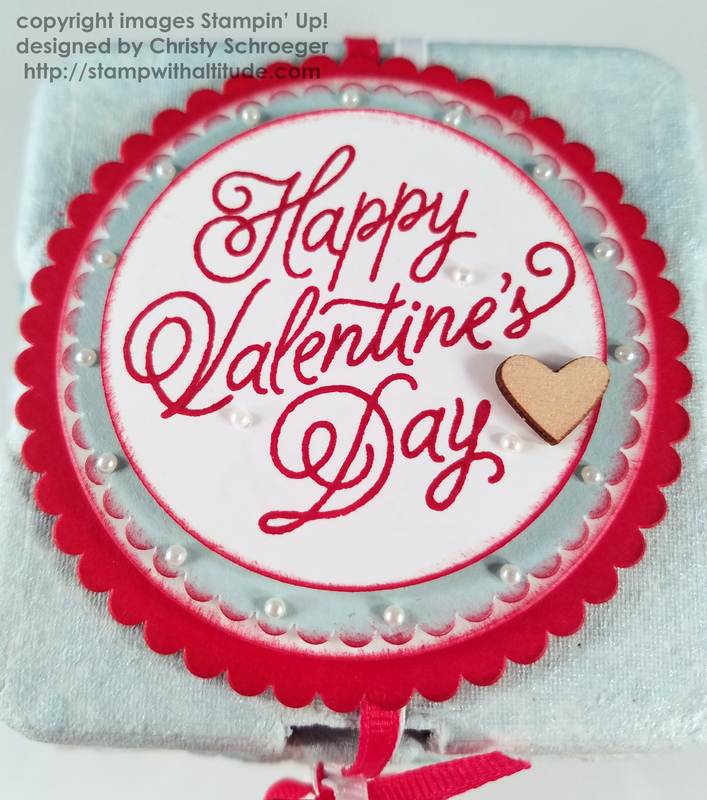 Notice the new Sending Love 1/8″ grosgrain ribbons, the Sending Love Embellishments, and Sealed with Love Stamp Set. I forgot to order the Sending Love DSP pack (I will on January 4th) or I would have used the Designer Series Paper too! hehe. Do you see that there are tiny pearls all around the Soft Sky scalloped circle. Click on the thumbnail on the left. OMG! It’s really cute. And there are a LOT of Dimensionals on this project. Every single later is popped-up! So inside the box, we have four “egg slots.” Each one filled with 3 yummy Dove Chocolates – making a dozen in all. I added a few embellishments inside too! You will find a thumbnail on the right. Click on it for a larger image. 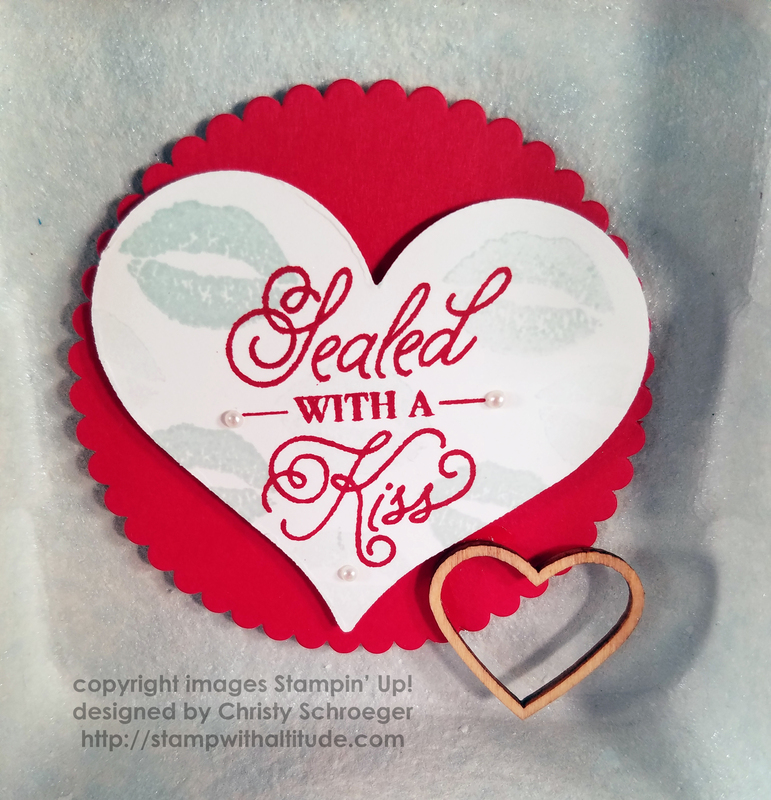 “Sealed with a Kiss” heart is stamped in Soft Sky lips. Some are stamped full on. Some are stamped off to give the heart some texture. You will also find the Sweet and Sassy Framelit Dies and the Duet Banner Punch. One of the best things that I like about our Photopolymer Stamps is that you can bend them a bit. This made the “I love you” fit even better in the punch than it already did! I sponged around the outside of the banner to make it pop against the inside of the box. So, what do you think? Do you like it? I hope so! I am going to be bring you another “love” card tomorrow. One done with a different new stamp set out of the Occasions Catalog. I just have to photograph it. I hope you like it! I want to go back downstairs and play with a few more sets…. I am super excited to play finally! YAY me! hehehe…..
Did you know that you can sponge around Glimmer paper? It may not be something you would need or want to do. But it sure does add some beauty! You just never know what’s going to happen until you complete the project. I should have taken a better picture of this tag but here’s what it is: Nothing too terribly fancy. It’s an ornament cut from Dazzling Diamonds Glimmer Paper, a scalloped circle and the company’s logo (part of it anyway). Each layer popped up on Dimensionals. Each white layer sponged with Night of Navy ink. They came out pretty snazzy, I think! … is an amazing chocolate from Russell Stover! OH!! I have only eaten one. I did share with my man. Did NOT share with the kids, yet. Here’s a little box I designed when I found myself the owners of this amazing chocolate. Of course, I bought a box of them (36!) and I was NOT going to eat them all. Although, I was tempted. There is nothing too special about the box as far as making it is concerned. Last year, I had a customer ask me for “Thank You” Christmas gifts for the craft fair. I made a few gum wrappers with Thank You on them. However, this was my real answer to her request. I am not sure if she came and shopped with me at the craft fair this year or not. I did sell some of these beauties!